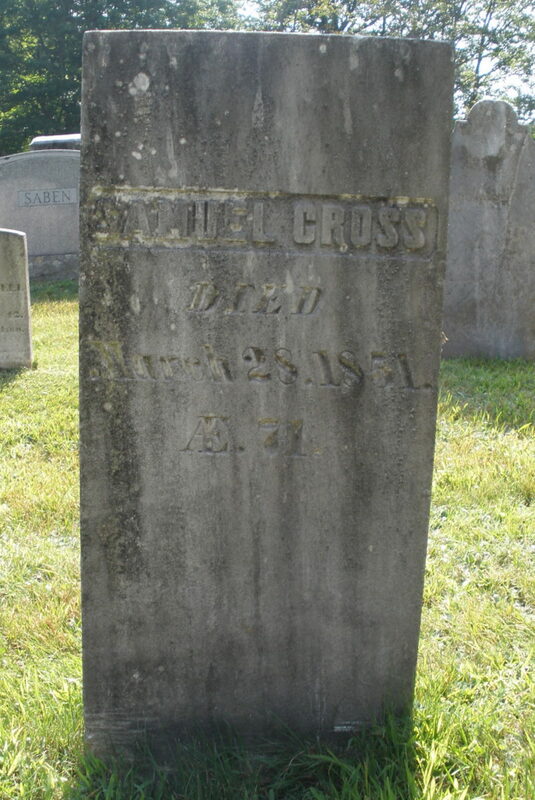 William CROSS (1738 – 1817) was Alex’s 6th Great Grandfather, one of 128 in this generation of the Shaw line. William Cross was born in 1738 in Barrington, Strafford, New Hampshire. His parents were Noah CROSS and Lydia CROMWELL. He married [__?__] in 1764 in Vassalboro, Kennebec, Maine. 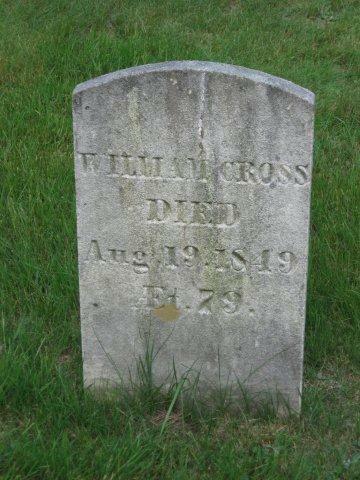 William died 19 Aug 1817 in Vassalboro, Kennebec Co., Maine. Judith [__?__] was born about 1740 in Strafford, County New Hampshire. Children of William and Judith. 9 Nov 1806 Belfast, Waldo, Maine 4 Sep 1862 in Detroit, Somerset, Maine. William is found in Vassalborough, Lincoln, ME in the 1790 census and in 1810 Vassalboro, Kennebec, ME census. respectively 80 and 92; Benjamin Runnells, 1834, aged 68; his wife, Rebecca, 1833, at the age of 67; Gideon Wing, 1842, aged 65; and Dr. Oliver Prescott, 1853, aged 62. The only record about Benjamin Cross and Sarah Lampson that I can find is that they were married 14 Aug 1785 in Hallowell, Maine. The groom could have been this Benjamin, age 19 or his uncle of the same name age 30. Some genealogies show Lawson, but the marriage record in Hallowell (Solemnized by Rev. Seth Noble:) shows Mrs. Sarah Lampson. There was a Lampson family living in Kennebec and Olive Lampson married Benjamin’s brother Jonathan Cross Mar 1792 – Vassalboro, Kennebec, Maine. At the summit of Mudgett hill is the Lampson homestead. About 1824 Benjamin Hussey, whose father, Isaac, had lived and died in Freedom, Me., came to Vassalboro and settled on the farm now owned by Benjamin G. Hussey, his grandson. Here James Cross had built a house on a two-acre clearing which his father, Benjamin Cross, had made, when this locality was known as Mudgett Hill, and was connected with the settlement at Cross Hill by only a foot path. In the 1800 census, a Benjamin Cross of the right age was living in Vassalboro, Maine with his wife (26-44 years old) a young man (16 thru 25) a boy (10 thru 15) and two girls under ten years old. William’s wife Judith [_?_] was born 1776 in Vassalboro, Kennebec, Maine. Judith died 18 Aug 1843 in Vassalboro, Kennebec, Maine and was buried at the Cross Hill Cemetery, Vassalboro, Kennebec County, Maine. The Cross Hill Cemetery, as originally laid out, contained but one-fourth of an acre. Here, in 1849, was buried William Cross, aged 79 years; and in 1853 Zebedee Cross, aged 48 years. These two slabs are the only authentic record in the community of the prominent old family, now extinct here, which gave name to the locality. Among the first burials in this ground was Mary Coleman Dyer, in 1813, aged 27 years. Other headstones here tell of Joel Gardner, who died in 1875, aged 97 years; John Palmer, in 1834, aged 84; Samuel Randall, 1838, aged 81; John Gaslin, in 1857, aged 90, and Mary, his wife, in 1837, aged 68; Seth Richardson, 1856, aged 78; Owen Coleman, 1834, aged 74; Daniel and wife Martha Whitehouse, 1835 and 1837, aged respectively 80 and 92; Benjamin Runnells, 1834, aged 68; his wife, Rebecca, 1833, at the age of 67; Gideon Wing, 1842, aged 65; and Dr. Oliver Prescott, 1853, aged 62. South of this was an early burying ground where scores of the pioneers found resting places. This ground was within what was later known as the Warren Percival farm, and for twenty-five years now the graves have been obliterated, and only a cultivated field marks the spot. William is in Vassalboro for each census 1830-1860, then moves to Augusta for the 1870 & 1880 censuses. Known children 1st marriage: William L. (1825), Sophia (1827), Caroline (1828), George H. (1829), Lorinda (1832), John Wesley (1835-1904), Sewell B. (1837), Eliabeth Ann (1839), Melissa D. (1844), Emily P. (1848). Known children 2nd marriage: Abby J. (1851), Alonzo B. (1855). In the 1850 census, William and Abigail were farming in Vassalboro, Maine with six children at home ages 2 to 17.
ii. 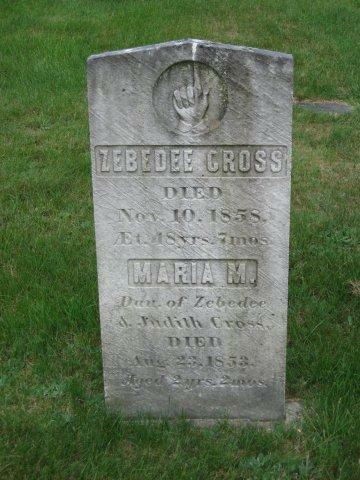 Zebedee Cross b. Apr 1810 Vassalboro, Kennebec, Maine; d. 10 Nov 1858 – Vassalboro, Kennebec, Maine; Burial Cross Hill Cemetery; m. Judith Keen (b. Jul 1821 in Maine – d. 11 Oct 1863 in Vassalboro) Zebedee and Judith had four children born between 1841 and 1858. In the 1850 census, Zebedee and Judith were farming in Vassalboro. James’ wife Ellen Dearborn was born about 1772. Her parents were Simon Dearborn and Margaret [__?__]. There are many contradictory genealogies about Hannah Varney’s marriage to a Cross 26 Mar or 14 Apr 1796 in Vassalboro Maine. Noah CROSS’s property in Middletown NH [bought in 1749] was sold to Silas Varney in 1769. Some say he married Josiah’s uncle James and in 1801 had a son James Jr who married 28 Oct 1827 in Vassalboro to Love Brown and died 8 Feb 1877 in Vassalboro. 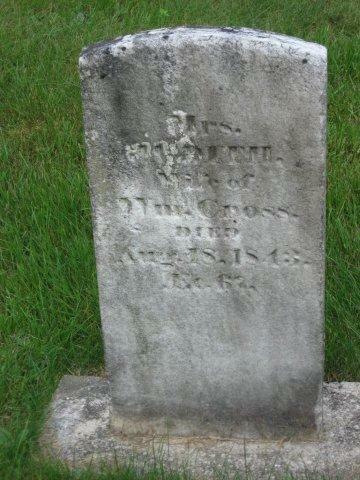 Other genealogies say Hannah married this Josiah Cross and in 1812 had a son Peleg Cross. This version conflicts with Josiah’s marriage to Patience Cushman 9 Nov 1806 Belfast, Waldo, Maine. There was a Hannah Varney who was born in 16 Apr 1783 in Dover, Strafford, New Hampshire near the Crosses. Her parents were John Varney and Miriam Hanson. She married her cousin Festus Varney 1 Oct 1800 in Farmington, New Hampshire and died 14 Apr 1853 inDover, Strafford, New Hampshire. In the 1840 census, Josiah was living in Chandlerville, Somerset, Maine. In the 1850 census, Josiah was living with his daughter-in-law in Detroit, Somerset, Maine. Detroit is 35 miles northeast of Vassalboro via I95 today. i. Peleg Cross b. 1812 in Somerset, Maine; d. 6 Apr 1891 in Detroit, Somerset, Maine; m. Margaret Randall (1806 in Maine – d. 1906 in Detroit, Somerset, Maine) In the 1860 , 1870 and 1880 censuses Peleg and Margaret were farming in Detroit, Somerset, Maine. Samuel’s wife Bethiah (Polly) Davis was born 28 Dec 1775 in Vassalboro, Kennebec, Maine. Her parents were Rev. War Vet Joshua Davis and Elizabeth Parker. Bethiah died 24 Mar 1845 in Vassalboro, Kennebec, Maine. In the 1850 census, Samuel was living with his son David and daughter-in-law Omenia Ames in Vassalboro, Maine. In the 1850 census, Caleb and Olive were farming in China, Kennebec, Maine with eight children at home ages 3 to 19.
iv. John Cross b. 26 Feb 1803 in Kennebec, Maine, (some genealogies say ); d. Aft 1870 census; m. Elizabeth (Betsy) Cote (b. 1806 Maine) In the 1860 census, John was farming in Augusta, Kennebec, Maine. vi. Bethiah Cross b. 16 Dec 1807 in Kennebec, Maine; d. 9 Jul 1849 Palermo, Waldo County, Maine; m. 31 May 1831 in Augusta, Maine to Clifford S Worthing (b. 11 Apr 1806 in Palermo, Maine – d.30 Dec 1878 Palermo, Maine) In the 1860 census, Clifford had remarried (Mary [__?__] b. 1813 Maine) and was farming in Palermo, Maie. ix. Simeon Cross b. 29 Mar 1813 in Kennebec, Maine; d. 14 May 1893; m. Mary J. [__?__] (b. 1824 Maine – d. Aft 1880 census) In the 1850 census, Simeon was farming in Windsor, Kennebec, Maine. In the 1850 census, David was farming in Vassalboro, his parents Samuel and Mary were living with his family. xiii. Salome Cross b. 16 Dec 1819 in Kennebec, Maine; d. 1855; m. 4 Jan 1843 in Vassalboro, Kennebec, Maine to Joseph Smiley (b. 16 May 1814 in Sidney, Kennebec, Maine – d. 19 Mar 1891 in Pasadena, Los Angeles, California) His parents were Hugh Smiley and Mary McDonald/McDaniels. i. Cynthia Cross b. 1795 in Vassalboro, Kennebec, Maine; d. 1874 in Vassalboro, Kennebec, Maine; m. 6 Dec 1812 – Vassalboro, Kennebec, Maine to Thomas Jefferson Withehouse (b. 1793 Maine). In the 1850 census, Thomas and Cynthia were farming in Vassalboro, Kennebec, Maine. ii. Samuel Cross b. 4 May 1797 in Vassalboro, Kennebec, Maine; d. 1884 in Vassalboro, Kennebec, Maine; m. 3 Dec 1818 in Vassalboro to Temperance Hawes (b. 27 Jul 1798 in Vassalboro – d. 1 Aug 1880 in Vassalboro) Her parents were our ancestors Isaac HAWES and Tamzin WING. In the 1850 census, Samuel was a miller in Norridgewock, Somerset, Maine. iii. Olive Cross b. 3 Aug 1801 in Vassalboro, Kennebec, Maine Olive’s first cousin of the same name was born 11 Aug 1801 (see above) so I may have them mixed up; d. 26 Oct 1867 China, Kennebec, Maine; m. 9 Oct 1825 Vassalboro to Caleb Thurston (b. 3 Sep 1797 in Exeter, Rockingham, New Hampshire – d. 6 Feb 1875 in China, Kennebec, Maine) In the 1850 census, Caleb and Olive were farming in China, Kennebec, Maine with eight children at home. vii. Elmira Elevina Cross b. 22 Jul 1808 in Vassalboro, Kennebec, Maine; d. 27 Sep 1888 China, Kennebec, Maine; m. 29 Feb 1824 Bradford, Penobscot, Maine to Walter Pinkham Gardner (12 Nov 1801 – 16 Mar 1876 China) In the 1860 census, Walter and Elmira were farming in Palermo, Waldo, Maine. viii. Gershom R. Cross b. c. 1807 in Vassalboro, Kennebec, Maine; d. 28 Apr 1878 – Lowell, Mass. ; m. 1829 in Vassalboro to Mary (Polly) Smart (b. 1809 Maine). In the 1850 census, Gershom was a farmer in Augusta, Kennebec, Maine. This entry was posted in -8th Generation, Line - Shaw, Missing Parents and tagged Vassalboro. Bookmark the permalink.